UV Adhesives Market size was estimated over USD 650 million in 2016 and the industry will grow by a CAGR more than 12% up to 2024. The growth in the U.S. medical industry will be the chief driver for UV adhesives market growth in next seven years down the line. The products are extensively used in hypodermic needles, syringes, catheters, filters, intravenous tube bonding. These products also find expanse application in medical devices such as respiratory system, diagnostic equipment, accumulator, oxygenator, butterfly device, intravenous catheter apparatus and other medical equipment. According to U.S. Government Accountability Office's (GAO), The U.S. medical device industry valued more than USD 140 billion in 2015, accounting nearly 45% of the global market. Growing geriatric population coupled with increasing contagious disease will influence the medical device market. The product application in medical devices owing to less emission of volatile organic compounds will drive the product market during the forecast timeframe. The U.S. Environmental Protection Agency, along with state and regional air quality regulators has highlighted the environmental advantage of UV technology. Various standards such as ISO 10993 and USP Class VI standards, defining the evaluation and testing of medical devices, will further provide the lucrative growth to the product market. The use of product in transportation industry also a positive indicator for the growth of the UV adhesives market owing to the use of UV glue in electronic components and other glass bonding applications in automotive & transportation segment. For instance, UV glue is used to secure parts of Cessna light aircraft and composite-to-fiberglass adhesion in the structure of the Chevrolet Corvette. These products are also used in industrial assembly application such as glass bonding, metal plastic bonding etc. Europe assembly glue registered nearly 900 metric tons which valued approximately USD 25 million in 2016. UV adhesives based on free radical curing acrylic chemistry are not suitable for bonding fully opaque medical devices. This will lead to substitution of UV glues from visible ray or electron beam cured adhesives, which will hamper the UV adhesives market growth. Electron beam cured adhesives can be used to cure opaque substrates such as paper, metallized paper, plastics and foil laminates. However, the large size and high cost of the electron beam equipment required has limited the use of these products. 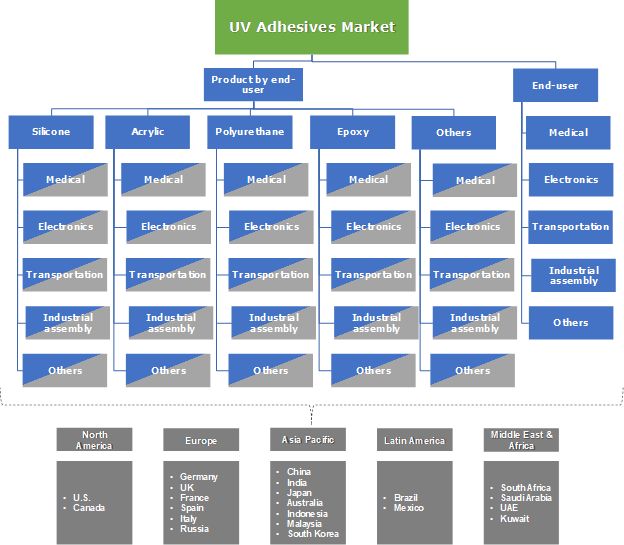 UV adhesives market is segmented, based on product, which include silicone, acrylic, epoxy, polyurethane and others including cyanoacrylate, polysulfide, polyesters, etc. Among these, acrylic accounted for over 40% share of the overall UV glue market in 2016 and is anticipated to witness the sluggish growth by the end of 2024. This product is majorly used in electronic assembly as they have inherent property with high dielectric strength. Silicone UV glue will grow with over 13% CAGR in the forecast timeframe. The product is highly used in dentistry and replacing amalgam filling. The growth in cosmetic dentistry will fuel the demand of silicone UV adhesives during the study period. 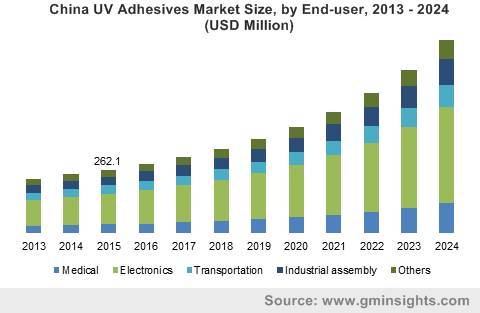 The UV adhesives market is diversified into four major application categories which include medical, electronics, transportation, and industrial assembly. The other niche end-user includes packaging, building construction, etc. Electronics segment generated revenue more than USD 332 million in 2016 and will grow at substantial rate by the end of 2024. The use of UV glue in touch screens, mobile phones, hard disk drives, micro speaker will drive the product market. The global mobile phones sales registered to be 2,014 million units in 2016 and will grow with significant rate by the end of forecast period which will further drive the UV glue industry by the end of forecast timespan. Transportation segment accounted for more than 10% of the total UV adhesives market share in 2016 and will lose its grounds in next seven years. This can be attributed to the use of other adhesives such as structural glue, anaerobic glue etc. which is comparatively cheaper than UV glue. The U.S. is a key contributor in UV adhesives market and accounting for over 75% of the entire North America market share in 2016. The country will witness a momentous growth owing to supportive regulations and standards regarding volatile organic compounds. Moreover, high investment in innovation and high technology medical equipment in U.S. will propel the market growth by 2024. India UV glue market was valued over USD 32 million in 2016 and is likely to grow at significant annual growth rate by the end of forecast timeframe. Various government initiations such as ‘Digital India’ and ‘Make in India’ program will support various electronic industries to setup their plants in India. The significant application of the product in encapsulation, potting, bonding in electronic components. This will bolster the demand of product market by the end of 2024. Some renowned name providing the immense contribution and defining the hierarchy of UV adhesives market are The 3M Company, Henkel, H B Fuller, Permabond BASF SE, Dow Corning, Ashland, Dymax, Corporation, DELO, Sika, and Three Bond Co. These companies are engaged in acquisition, product and technology development in the market. Increasing automotive and transportation industry along with electronic industry in Asia Pacific region will provide the lucrative growth to product market. Stringent government norms related to air pollution will also augment the UV adhesives market as the product emit very low amount of volatile organic compounds.